All too often theaters call for plays based on current political / social issues. Not that theatre shouldn’t dabble in contemporary matters. On the contrary, the ephemeral nature of theatre makes it a perfect medium for capturing the raw emotions of the moment. The troubles arise when the playwrights and directors in question choose to isolate potential audience members via stance and era. Timelessness is sacrificed in exchange for sensationalism; characters are made into tools to shout an opinion as opposed to telling a story future generations will enjoy. Topics of contemporary debate (i.e. equal marriage, healthcare, emigration, etc.) sprout up through theaters requesting new plays discussing said topics. The irony is most of these theaters have no desire to have an honest discussion on both sides of the debate. There is only the desire to feed off the verve of the moment, and to speak in a one-sided manner on a complex issue whilst maintaining a smug sense of moral superiority over those who hold opposing views. The copious amount of forgettable sensationalist plays makes one truly appreciate a well-crafted script that tackles a contemporary issue delicately, showcasing the author’s stance on the topic without drowning the audience in their opinion. Deborah Salem Smith’s Love Alone is an excellent example of a play which can speak on the issues of equal marriage rights and medical malpractice with maturity, never demonizing or idolizing either party, focusing instead on how these issues effect lives on each side. 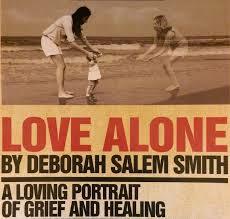 Love Alone begins immediately after complications during a minor operation result in the death of 48-year old Susan. What follows is the fallout of the incident as it effects Susan’s wife of twenty years and daughter, as well as the anesthesiologist on call during her operation. Smith properly crafts her tale in such a way that the audience is made aware that there are great wrongs in regards to denying equal marriage rights and corruption in the medical industry that need to change, yet these act more as the set pieces to the character and story development as opposed to being a soapbox to uncouthly shout one’s opinion. Rather than commence immediately after the curtain speech as most plays do, Love Alone leaves actor Dawn Erin (Helen Warren) onstage, casually reading in the hospital’s waiting room, with the start of the production signaled by the Intensive Care light flashing above Erin, a welcome break from one’s expectations. It’s quickly apparent that Andy Berkovsky (director and production designer) has utilized The City Theatre’s space to portray overlapping scenes in one set. Made up to appear like a modern apartment, the singular set acts as multiple apartments, offices, hospital rooms, and more, often simultaneously. The result is much more effective than if each segment of the stage was designated for a separate location as characters often discuss one another figuratively miles away yet literally inches from one another. A deceptively wide space is open for action on the limited stage. The actors successfully fill the space, occupying the natural breaks in their overlapping scenes with in-character poise as opposed to simply waiting for their next line. Berkovsky ought to be congratulated for successfully juxtaposing opposed characters in such a way that emphasizes their contention with one another yet showcases the similarity in their struggles. No one onstage is the hero or the villain. From their first scene together it is apparent that Erin and Jesselyn Parks (Clementine) are the two stand-outs of the production. Erin floats beautifully between enthusiasm and desperation as she walks the line between acceptance and denial. Parks portrayal of the rightfully conflicted Clementine, Helen and Susan’s musician daughter, is spot on. She is challenged to remain driven and independent yet loving and loyal as she and Helen, each other’s closest ally and confidant, grow distant. Together their onstage chemistry is perfect. Though not blood-related (the deceased Susan being Clementine’s biological mother), they act as true friends and family to one another. Despite the disagreements they amass on proper grieving and their lawsuit against the hospital, they never lose sight of their loyalty, obviously loving and protective of one another above all else. Samantha Brewer (Dr. Becca Neal) deserves an honorable mention as Susan’s implicated anesthesiologist. Brewer’s deteriorating home life and career exquisitely mirrors Erin’s growing obsession with the lawsuit she originally wanted nothing to do with. Both women know how to portray a shattered sense of self thinly veiled by false confidence and certainty. Issues with the production came from actors Gabriel Diehl (J.P. Whitman) and Phoebe Moore (Decent Services Representative, Nurse, and Lawyer). Diehl, portraying Brewer’s weary husband, drags vocally. At first I assumed this would not be lasting concern, yet the end result was a complete lack of agency to during his scenes. His character was in a rough situation, but Diehl rarely seemed invested in his and Brewer’s concerns so I struggled to empathize with him. Moore’s collection of minor characters each gave me a unique frustration. The Descendent Services Representative felt stunted, noticeably attempting to detach herself from Helen and Clementine’s suffering, yet making her rote, office-like persona the entirety of the character. As the Nurse, Moore forced too much intensity into scenes that did not require it, often making her discussions with Dr. Neal feel unnatural. Lastly, the Lawyer began stern and more knowledgeable than Dr. Neal, which I enjoyed for the role-reversal aspects of the scene, yet devolved into bombastic shouting that felt out-of-place. A lack of subtly can be attributed to the roles which, when compared to the rest of the cast, made their scenes drag. My only other issue with the production comes from the copious usage of overlapping dialogue. Whether these were acting, directing, or playwriting decisions I do not know, but the frequency with which they occurred made some scenes feel a little too frenetic. There will always be debate and differing opinions among people. Plays like Love Alone handle these discussions as elegantly as one can hope, acknowledging their effect on individuals as opposed to stating what they believe to be right and wrong without room for deliberation. There is no clear right or wrong here, but that’s what makes the production poignant. Despite some setbacks, I greatly enjoyed The City Theatre’s Love Alone and recommend it to anyone who enjoys contemporary theatre without the need for opinionated soapbox speeches. It’s a welcome start to The City Theatre’s 10th Anniversary Season. Love Alone continues playing at The City Theatre every Thursday, Friday, and Saturday at 8pm and Sundays at 3pm until October 18th.